Hi, my name is bava, and I have an Instagram problem. I never planned to get on Instagram, and I was even less inclined to enjoy it. But 616 posts and 18 months later I’m realizing I am deeper in then I ever intended. I tell myself I can quit anytime, but now that Twitter holds little joy for me and Mastodon feels like a temporary rebound relationship, Instagram has quietly become my go to. My network is mainly friends and family, and I love that alongside an announcement from my nephew on Long Island that he got a Lacrosse scholarship to Stonybrook (go Kevin!) will be an art piece by my dear friends’ daughter in Portland, Oregon. I like those random visual juxtapositions, and I also like that it’s pretty much photos from folks I know. But how did it happen? St Peter's Cathedral this afternoon. I have next to no presence on Facebook, and I prefer it that way. I figured it would be the same for Instagram, but given my current hobbies of hiking and taking photos I’m not so sure I will be leaving Instagram anytime soon. I’ve been a Flickr member since 2005, and I have over 17,000 photos on that site. When they recently changed their terms after being acquired by Smugmug I immediately paid the ransom for my photos. I’m by no means surprised at this development, and frankly I would be surprised if anyone was surprised at this in 2018. How long can we feign outrage when these companies repeatedly confirm what we already know, they provide a “free” service in exchange for our data? In fact, I’m not so sure paying Smugmug will mean my data is protected, but handing over that $30 was simply a stop-gap measure to buy some time. I want to experiment with hosting my photos differently in 2019, and one of the highlights of 2018 I forgot to mention in my last post was seeing the Google Archive team present on their work with the Data Transfer Project at MyData in Helsinki this August. This open source software enables you to move photos between services like Google Photos, Flickr, Instagram, etc. seamlessly, and I would love to see what it would look like to push those photos into a WordPress (or whatever your publishing poison may be) site template with custom post types that could map all the metadata via APIs. It’s Kin Lane stuff for sure, but I was pretty blown away at the demo wherein they pushed all their photos from Flickr to Google Photos, and vice versa. But I am not so interested in moving stuff off of one service to another, because that simply means you have a new landlord to be beholden to, but for me the thrill was the underlying idea of seamless data portability between services that means moving your stuff when things go bad is trivial. But I digress, this post was supposed to be about my Instagram problem. But really I don’t have an Instagram problem as much as I have a photo problem. I’ve used Flickr as an archive for my photos, as well a sporadic repository for the images in my blog posts, for a while now. I don’t keep up with it regularly, but a few times a year I will make an effort to make the photos I automatically send there through my phone public with a title and occasional description. I also have Dropbox backing up all photos and video on my phone. I am definitely backing up my photos, but Instagram is the only place I am really doing anything with them, i.e. sharing them. I used to do that on Twitter a bit, but they increasingly seem out of place there. 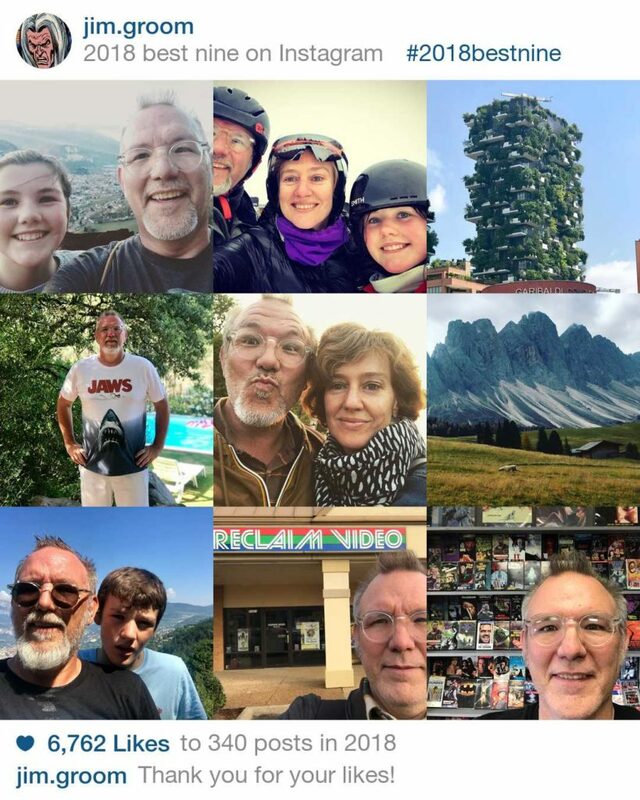 As you can see from my top nine above, my photos are mainly of me and my family hiking, snowboarding, traveling, or getting eaten by the fashion shark. There’s a lot of play there, and the story is quotidian and personal—which has by and large been my attraction to the web. [Politics on social media continue to bore me, despite how much I should care.] But the above top 9 is not the true top 9, the true top 9 is the Duke top 9! Did I mention I got a dog in 2018? But not just any dog, but an Italian Spinone to go with my wardrobe. He’s everything. He was a rescue, and I have already convinced the family that we will be getting a spinone puppy in the spring, I am hooked. There’s this looming presence in my life now…. I did not realize that what I needed to complete my domestic bliss was a gigantic, shaggy, slobbering beast to accompany me on my daily hikes. He’s more like a Yeti than a dog when he finds himself in the Dolemites. I think my Halloween costume was pretty convincing this year. Duke has made posting that much more fun. I just like sharing the goings on of casa bava’s latest addition. I’m absolutely open to photo sharing alternatives, but until I figure out something better I’ll be continuing to cultivate my Instagram problem with my shaggy beast bestie. This entry was posted in Flickr, Instagram, pictures and tagged Duke, Flickr, Instagram, photos. Bookmark the permalink. I would love to see it, and I need to hit up D’Arch Norman abouthos WP photo workflow. You add images as post content, then the theme gets funky with php and makes albums for you. I was getting ready to abandon Flickr after they were sold to Verizon, expecting that they would either get rid of it or find some obnoxious way to monetize it. The sale to SmugMug (not Snapfish) convinced me to stay because of that company’s history running a highly professional service dedicated to photography. I hope some of that will rub off on Flickr. I’m especially hopeful they will be able to revive the social aspects of the service that were at its core for the early years. As to Instagram, doesn’t it bother you that their parent company is Facebook? Considering their incredibly poor record of handling personal data, I have to wonder if some of that isn’t going on behind the scenes at Instagram. Thanks for the correction on SmugMug, a lazy mistake on my part that is now fixed. I hope you are right about SmugMug doing an overhaul, but there 1000 image limit (and thereafter deleting anything beyond that for non-paying members) gives me pause There will be a big hole in the photo web for sure quite soon. I have about 1/20th the number of photos you do on Flickr, so while you’re right – I wasn’t surprised – I didn’t pay up. If you’re looking for a self hosted option, I’ve been using (and contributing to) Lychee, which runs on MySQL and a lot of PHP wizardry. You can also import photos from other locations (server directory or even URL) with a cron job, which means you can automatically back up or copy photos you post directly to Instagram.